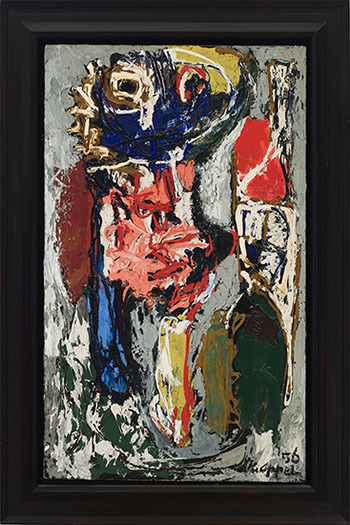 signed and dated 1956 and on verso inscribed "ALR 49" / "14" / "11"
Karel Appel was the most prominent Dutch member of the post-World War II group of abstract artists who took the name CoBrA, which was active largely in Paris from 1948 through the early 1950s. Jean Dubuffet from France and Asger Jorn from Denmark were other prominent members. The memorable name is simply an acronym of the first letters of their native cities: Copenhagen, Brussels and Amsterdam. With his CoBrA peers, Appel sought a liberatory art, one no longer suppressed by the extreme censorship and persecution of mid-twentieth-century European fascism. The fetters of World War II and earlier art in the European tradition were to be broken; instead, CoBrA artists sought authenticity and direct expression in the aesthetic creations of children and what were then seen as “primitive” peoples’ art and crafts. A 1949 issue of the journal Cobra, for example, was devoted to folk art. 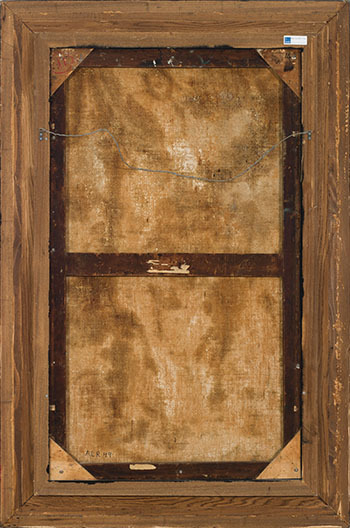 Appel’s Untitled typifies his exuberant painting of the 1950s, a period that saw him exhibiting widely and to great acclaim (including the UNESCO Prize at the 1954 Venice Biennale). Its vibrant colours and thick, tactile application of pigments embody his version of painterly freedom. Appel rejected the creation of spatial illusion stemming from Cubism. Any sense of three dimensions here comes instead from the buildup of pigment. In the left centre of the canvas, for example, heavy, dark channels of oil paint stand on top of only slightly thinner passages of earth red, white and blue. We feel this painting as much as see it. When we describe this painting as “abstract,” we mean that it is not overtly reproducing the appearance of our everyday world. But “abstract” was and remains a broad and flexible category. Because abstract expression had long been seen as a vehicle to both authenticity and freedom, it was the signature visual language of CoBrA. Never dogmatic, Appel did not subscribe to any doctrine of “pure” abstraction divorced from the realities of life. Thus, it is appropriate that this painting hints at that most traditional of art genres, portraiture. Do we not see a head with eyes, a nose and mouth at the top of the image? Might the dark green form at the lower right be a protruding knee, suggesting a torso above it? 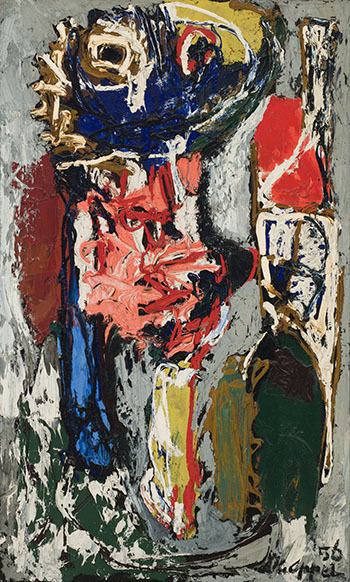 Appel painted many portraits, some quite abstract in the sense that the subject is not identifiable, some explicitly – if wildly – descriptive, such as the Portrait of Sir Herbert Read, 1962, in the collection of the Montreal Museum of Fine Arts. Perhaps it is this quality of depicting the human, but also of simply reveling in paint, that makes this canvas stand out. Appel himself suggested such an interpretation of his work. In an interview broadcast in 1968, he denied that he was truly an “expressionist,” as was often said. His aspirations went well beyond stylistic labels. “For me man is an infinitely creative space,” he claimed. “And because of that I am always looking to expand my work, you know, to find space.” The powerful execution of Untitled makes it feel much larger than its physical dimensions. We thank Mark Cheetham, Professor of Art History at the University of Toronto and author of Abstract Art Against Autonomy: Infection, Resistance, and Cure since the 60s, for contributing the above essay. This lot is accompanied by a certificate of authenticity from the Opera Gallery, dated September 25, 2006.